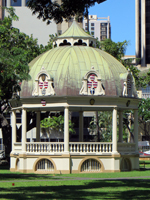 Kamaaina Sundays at Iolani Palace – Hawaii Residents Get in Free. Kamaaina Sundays at Iolani Palace! 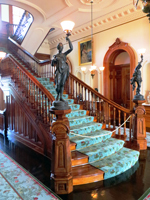 Happening only once each month*, Kamaaina Sunday at Iolani Palace is a great opportunity for Hawaii residents to tour through our state’s royal history, free of charge. 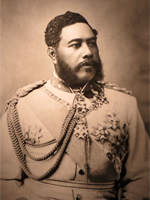 This is your chance to experience the proud tradition and enlightened leadership of the Hawaiian monarchy during the, unfortunately, short-lived dynasty of King David Kalakaua – Hawaii’s “Merrie Monarch”. 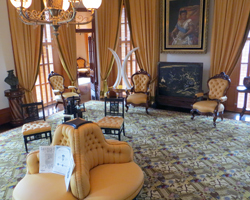 For a guided tour of Iolani Palace, you’ll need to get there early. The docents take new tour groups every 15 minutes from 9am to 11:15am. However, if you’re content with a handheld tablet device and a set of headphones, the audio tours run every 10 minutes from 11:30am to 4pm. 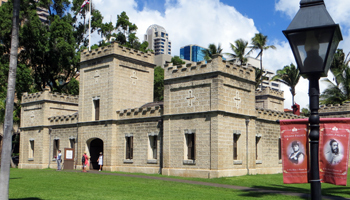 To join the first available tour group, sign-up with the counter clerk at the gift shop inside the barracks building (looks like a small medieval castle to the back-left of Iolani Palace on palace grounds). They do not accept reservations. Just show your valid Hawaii ID and/or a valid military ID with proof of Hawaii residence. I’ve never been on a guided tour of the Hawaii royal palace, but I’ve heard good things about it. I have, however, done the audio tour, and it was very enjoyable. 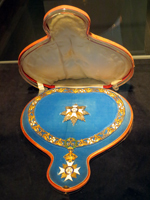 All tours include the palace interior and basement gallery. You should allow at least 90 minutes to see it all. During our most recent visit, my family stayed a little longer than two hours. Iolani Palace is normally a paid Hawaii attraction; and this tour is worth the price of admission (in my opinion). I don’t know how many royal palaces you’ve been able to tour, but I’ve only been in two (Spain and Hawaii) or three (if you count The White House), so I think it’s a big deal! Assuming you don’t count The White House, this is the only royal palace in the United States – and it was the first royal palace in the world to use electricity (also before The White House). So if your personal interests lean toward discovering Hawaii history and Hawaii culture, this unique Honolulu experience could be a highlight of your Hawaii vacation. So as not to spoil your adventure with too much information, I’ll simply say that to wander through this well-preserved Hawaii historic landmark is like a stroll back through time. As I’m sure you’d expect… you’ll see the throne room, dining/leisure areas, and even the royal bedchambers of Hawaii’s last ruling monarchs. Then you’ll probably be surprised to discover the many ways these well-educated and enlightened leaders championed modern thinking, the newest technologies, and even the development and preservation of Hawaii culture through music, art, and dance. 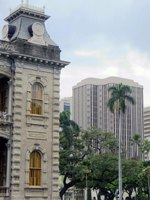 Your tour of Iolani Palace will then come to an end as the story of the Hawaiian monarchy also came to a close – with the illegal overthrow of a sovereign kingdom, followed by the transformation of grand palace into guarded prison for the deposed queen. 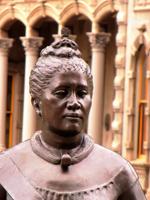 As much as this particular part of Hawaii history can become a political hot topic, I think it was addressed with the same dignity and diplomacy that Queen Lilioukalani herself demonstrated when she abdicated the throne without bloodshed or violence. Guided tours are available Tuesday through Thursday from 9am to 10am and on Friday and Saturday from 9am to 11:15am. Guided tours run every 15 minutes. Meanwhile, audio tours are available Monday from 9am to 4pm, Tuesday through Thursday from 10:30am to 4pm, and on Friday and Saturday from noon to 4pm. Audio tours start every 10 minutes. Not a local resident? This is one of those Hawaii attractions that’s worth paying for. You might want to book a tour. 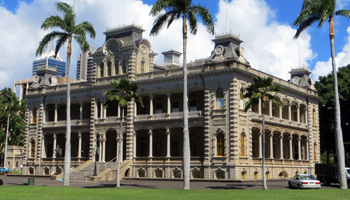 Iolani Palace - CLICK HERE! (Link opens a new window/tab). This is also one of the Oahu attractions you can experience using the Go Oahu Card. Over 30 Oahu Attractions, Tours, Museums, Activities & Sights for 1 Low Price are included with the Go Oahu Card! Link opens a new window/tab. 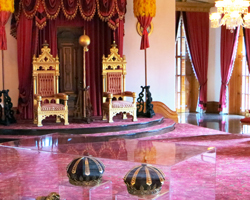 The Iolani Palace basement gallery exhibit is included in both the guided and audio tours; or it can be viewed independently for a nominal fee. Please note that children ages four and younger are allowed access only to this portion of the palace. You should take this into consideration when planning Honolulu tourism activities for your family vacation in Hawaii. Furthermore, there aren’t any playgrounds or facilities designed specifically for young children – probably because it’s a royal palace. Shocking! Nevertheless, there’s plenty of grass to run your kids in around if they’ve got energy to burn. Just make sure they treat the grounds with the respect due a king or queen. If you plan your tour for a Friday, there’s a good chance you’ll be able to see the Royal Hawaiian Band perform for free at noon on the Iolani Palace lawn (weather permitting). There is a gift shop where you can purchase some very light refreshments, but there isn’t any restaurant or snack bar. Furthermore, you may not enter the palace with food, drinks or gum. 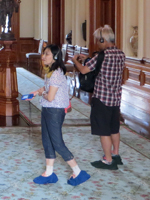 Before entering the palace itself, you will be required to cover your shoes with fabric booties to protect the floors from scratches and debris. Likewise, if you depend on a motorized scooter or wheelchair, you will not be allowed to use that for your tour. They will, however, provide a wheelchair if you require one. Parking is never particularly good anywhere in downtown Honolulu, and the Iolani Palace is no exception. There’s a fairly-decent amount of metered parking on the palace grounds. But that fills up fast. There’s also metered street parking along the front and left side of the palace. But because the palace is surrounded by one-way streets, you may find yourself circling the block trying to find a spot. Beyond that, there are various municipal and commercial parking lots in all directions. But those can get pricy. For simplicity’s sake, you might want to consider taking TheBus. There are bus stops everywhere in this part of Honolulu, and the busses run every few minutes. For bus route/schedule information click here (link opens a new window/tab) or talk to your hotel concierge.